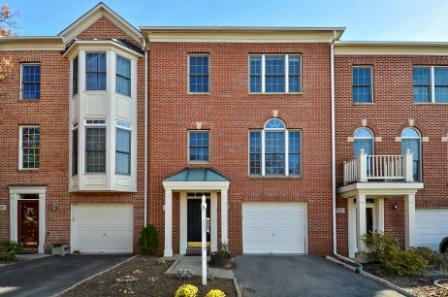 Regal 4BR/3.5BA end-unit 2-car garage townhouse in Rose Hill Falls built by The Magruder Companies. This showpiece home spans over 2,500 sq. ft. of living space on three levels and has been recently remodeled and renovated. Special features include: hardwood, marble flooring, and designer ceramic tile on entire main level; 9-ft, 10-ft, cathedral and vaulted ceilings; elaborate chair rail and crown moulding; two-inch blinds, Roman shades and plantation shutters; custom painting throughout. Covered portico side entrance to marble 2-story foyer; formal living room and dining room separated by decorative columns; rare main level study with floor-to-ceiling bay window; REMODELED kitchen with NEW wood-grain ceramic tile flooring, granite countertops, glass tile backsplash, Subzero & Jenn-Air appliances, granite island/breakfast bar with cooktop and pendant lighting; breakfast nook with skylight; family room off kitchen with NEW wood-grain ceramic tile flooring, floor-to-ceiling stone FP, recessed lighting, bay window and French door to composite deck; MBR with vaulted ceiling, bay window enormous walk-in closet & RENOVATED master bath with NEW designer ceramic tile, NEW Cesar Stone vanity, skylight, NEWKohler soaking tub, and NEW oversized walk-in ceramic tile shower with frameless glass enclosure; two additional BR’s on upper level each with vaulted ceilings; ceramic tile hall bathroom; walk-out lower level with recreation room or 4th BR, walk-in closet, full ceramic tile bath, and French door to flagstone patio and back yard. Be part of the vibrant Rockville Town Center featuring shopping, fine restaurants, sidewalk cafes, the new Rockville Regional Library, Regal Cinemas and other entertainment and cultural facilities. 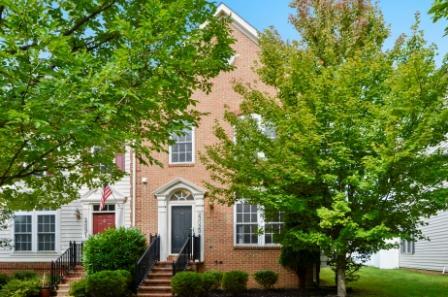 Fashionable 3BR/3.5BA brick-front luxury townhouse built by Winchester Homes and backing to tree-lined common area and 1/2 block to City of Rockville’s Bullard Park. Approximately 2,400 sq. ft. of living area on three levels plus a one-car garage just minutes from Metro’s Red Line. Special features including: wide-plank maple hardwood flooring on entire main level, 9-ft. & cathedral ceilings, elaborate mouldings and NEW custom painting throughout. Open two-story foyer entrance with hardwood floors; REMODELED gourmet kitchen with 42-inch cabinets, NEW stainless appliances, granite countertops and island cook top/breakfast bar; family room off kitchen and glorious breakfast room/sunroom with French door to deck; formal living room and dining room; MBR with cathedral ceiling, walk-in closet and luxury Super bath with two-person Jacuzzi soaking tub and separate shower; two additional bedrooms plus second full ceramic tile bathroom on upper level; lower level recreation room with corner gas fireplace, full ceramic tile bath, separate den/exercise room and laundry room; expansive deck overlooking fenced yard. Be part of the newly designed, vibrant Rockville Town Center featuring shopping, fine restaurants, sidewalk cafes, the new Rockville Regional Library, Regal Cinemas and other entertainment and cultural facilities. 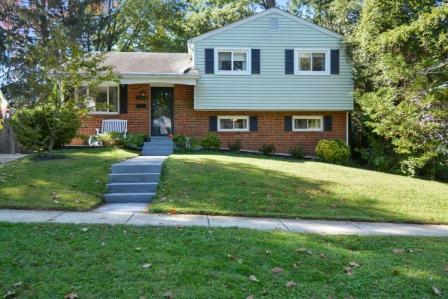 Charming 3BR/2.5BA split level on private lot in Kensington with mature landscaping and double sidewalk lined streets. This home boasts approximately 1,700 square feet of living area on three levels including a great sense of light and spaciousness with designer home appeal. Special features include custom painting, updated lighting and custom window treatments throughout; living room and separate dining area opens to kitchen with hardwood flooring; REMODELED gourmet kitchen with ceramic tile flooring, painted cabinetry, granite countertops, NEW stainless steel appliances, subway tile backsplash and granite breakfast bar area; spacious master bedroom suite with hardwood flooring and double-door closet; REMODELED master bath with ceramic tile flooring and walk-in shower; two additional bedrooms on upper level with hardwood flooring and REMODELED ceramic tile full bath; lower level features recreation room with NEW Berber carpeting, wainscoting, separate utility/laundry area with ample storage, half bath and walk-up stairs to backyard; vinyl replacement windows and spacious attic for storage; enjoy entertaining on the concrete patio in your private fully fenced-in backyard; ideally located near downtown shopping and historic district, commuter routes including Metro, Marc Train and easy access to I-495. 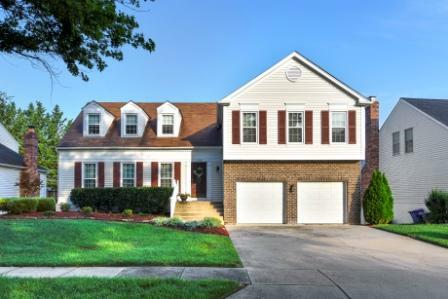 Storybook Cape Cod located minutes away from Winchester’s Old Town Walking Mall and John Handley High School. This property is situated on a beautiful lot featuring 5BR/2FB with a separate parking pad for 4+ cars accessible through private alleyway. Approximately 3,000 sq. ft. of living space on three levels including unfinished lower level. Special designer features include: hardwood flooring, cathedral ceilings and upgraded lighting fixtures throughout. Inviting foyer leads into formal living room with hardwood flooring, wood burning fireplace and separate access to side covered porch; separate dining room with double exposure and pocket door to kitchen; kitchen with ceramic tile flooring, ample cabinetry, GE appliances with covered portico entry; spacious master bedroom with hardwoods and updated ceramic tile master bath; two additional bedrooms with hardwood flooring on main level; updated second full ceramic tile hall bath with dual vanities and vessel sinks; upper level features loft, two bedrooms and extra storage area with wide-plank hardwood floors and cathedral ceilings; unfinished walk-out lower level with laundry room and separate recreation room and workshop ready to be finished; manicured landscaped fully fenced in yard with side patio areas and porch perfect for entertaining; other features include NEW HVAC system, NEWER roof and NEWER vinyl windows. 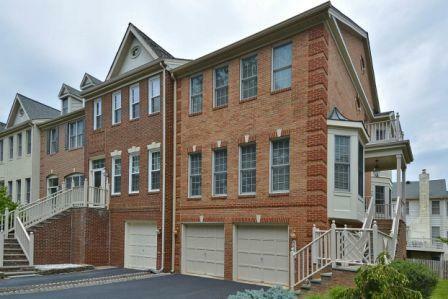 Designer 3BR/3FB/2HB, two-car attached garage townhouse on quiet cul-de-sac BACKING TO DOGWOOD PARK. This Westover floor plan built by Craftmark Homesfeatures over 2500 sq. ft. of living area on four levels including: 9-ft. and cathedral ceilings, gleaming hardwood floors on main level, designer ceramic tile baths, NEW custom painting inside and out, elegant mouldings, NEW upgraded lighting throughout. Foyer entrance with ceramic tile flooring steps up to formal living room with floor-to-ceiling bow window; separate dining room with decorative columns defining the living room; gourmet kitchen with 42-inch painted cabinets, NEW quartz countertops and backsplash, NEW GE stainless appliances, breakfast bar and pantry; breakfast area with NEW French slider to rear deck overlooking private wooded setting; family room off of kitchen with wall of windows, recessed lighting and wide back staircase to upper level; master bedroom suite with cathedral ceiling, walk-in closet, sitting room with wall of windows, and designer ceramic tiled Super bath with corner soaking tub and separate shower; additional en suite bedroom on this level; upper hallway with laundry center; BONUS fourth level en suite bedroom with two dormer windows and ceramic tile full bath; fully finished lower level with recreation room or 4th bedroom, gas fireplace, half bath, French door access to fenced rear yard and access to two car garage; four year old roof; lawn care included in HOA fee; central location with easy access to I-270, Rockville Pike; Stanford Grille and Clydes of Tower Oaks directly across from the neighborhood. 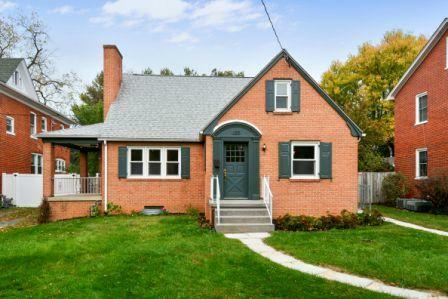 Charming 5BR/3FB/2HB four-level Victorian with old-fashioned wrap around front porch on 2.88 private acres down a long driveway far off of New Hampshire Avenue right across from Greystone Farm http://www.greystonefarm.com/. This home was built in 2007 and features over 5,000 square feet of living area on four levels and a two-car side load garage. Offering a great sense of light and spaciousness with 9-ft. ceilings in the lower level; NEW custom painting throughout, hardwood floors, and NEW carpeting; two-story foyer entrance flows into study; formal living room opening to formal dining room; gourmet kitchen with granite countertops, GE Profile stainless appliances and center island; breakfast room with sliding glass door to expansive paver patio; expanded 25 x 26 family room with propane gas fireplace and dual ceiling fans; master bedroom suite with sitting area and two walk-in closets; master bath with two-person corner soaking tub and separate shower; two additional bedrooms and a den with access to upper level bedroom suites on the same level; full bathroom and upper level laundry room; BONUS fourth level with two bedrooms and a full bath; lower level recreation room with an industrial-look featuring painted open ceiling, track and halogen lighting, NEW wall to wall carpeting, and half bathroom; professionally manicured landscape with specimen trees and shrubs, front and side porch, paver patio, and multiple storage sheds and metal work shop. Stunning 4BR/2FB/2HB Winchester Cardiff II model with two-car garage situated on a beautiful lot with tree-lined streets and sidewalks. This home features over 3,400 square feet of comfortable living space on three levels including: a great sense of light and spaciousness with designer home appeal featuring custom painting, upgraded flooring, custom window treatments and NEWER windows; ceramic tile flooring and vaulted ceiling in foyer, living room with Brazilian cherry hardwoods and crown moulding; dining room with Brazilian cherry hardwoods, bay/picture window and elaborate mouldings; REMODELED gourmet maple stained cherry, granite, and stainless kitchen with ample storage and breakfast area with ceramic tile flooring; family room with hardwood flooring, floor-to-ceiling brick wood burning fireplace featuring flanking custom built-in bookcases and NEWER slider to deck; spacious master bedroom with NEW carpet and separate sitting area; master bath with ceramic tile walk-in shower, Jacuzzi Whirlpool tub with skylight above, dual vanities and walk-in closet; three additional bedrooms on the same upper level with NEW carpeting and laundry area; walk-out lower level with recreation room, recessed lighting, half bath; enormous storage area and separate utility room; two-tiered deck with stairs leading to concrete patio and fully fenced-in backyard perfect for entertaining. Neighborhood amenities include pool (membership available), basketball and tennis courts, picturesque parks, lakes and walking trails. 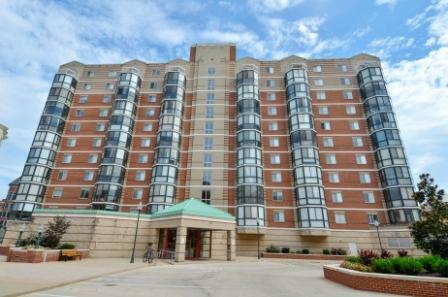 Conveniently located near shopping, restaurants and quick access to I-270 (Exit 13-B). 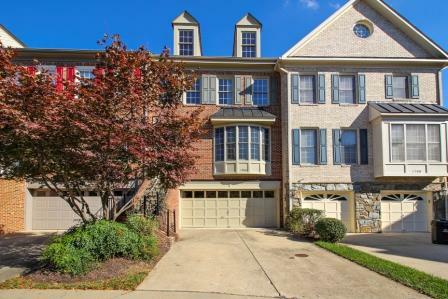 Elegant 3BR+den/3.5BA, end unit, brick, two-car garage townhouse on premium side-street lot, facing open green space area, and only one block from the neighborhood pool. This desirable floor plan features approximately 2640 sq. ft. of living area on three levels including: 9-ft. ceilings on main and upper levels, gleaming hardwood floors on entire main level, designer ceramic tile baths, NEW custom painting, elegant moulding, upgraded lighting and custom window treatments throughout. Foyer entrance opens to formal living room with floor-to-ceiling windows and bay window; gourmet kitchen with 42-inch maple cabinetry, granite countertops and backsplash, NEW Whirlpool stainless appliances, granite breakfast bar center island and pantry; breakfast room off of kitchen; family room with gas fireplace and French door to private fenced back yard and walkway to a detached garage on one of the largest lots in the neighborhood; master bedroom suite with custom walk-in closet, sitting area with wall of windows, and luxury designer ceramic tiled bath with whirlpool tub and separate walk-in shower; two additional bedrooms and ceramic tile hall bath on upper level; fully-finished lower level with recreation room, den, full bath, and utility/storage room. 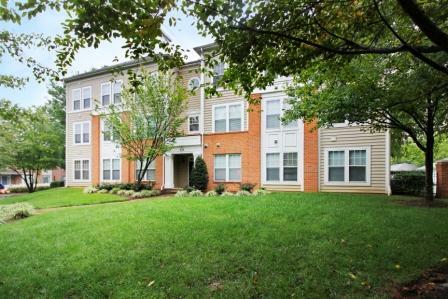 Conveniently located in close proximity to the newly-designed, vibrant Clarksburg Village Center (featuring Harris Teeter, Starbucks, mixed use shopping, and restaurants) as well as The Shops at Seneca Meadows anchored by Wegmans. Neighborhood amenities include sidewalks, pools, tot lots and jogging/walking paths, and newly-built middle school. Chic, sun-filled, totally remodeled 2BR/2FB CORNER condo. Approximately 1300 sq. ft. of living area (tax record incorrect) with special features including: 9-ft ceilings; NEW custom painting; NEW laminate wood-grain flooring throughout most of unit; upgraded lighting including recessed lighting; custom window treatments. Foyer entrance with coat closet; living room with gas fireplace, built-in cabinetry, and sliding glass doors to private covered deck; formal dining room with double window and chandelier; gourmet open kitchen with 42-inch maple cabinets, NEW granite countertops, breakfast bar, and NEW Whirlpool stainless steel appliances; BONUS family room off of kitchen with full windows and recessed lighting; master bedroom suite with ceiling fan, walk-in closet and second closet; lavish master bath with maple vanity, oversized walk-in shower with bench seat, and linen closet; second bedroom with walk-in closet featuring custom shelving and drawers; second full bath with ceramic tub surround; hallway with laundry center equipped with NEW full-sized washer & dryer. NEW water-source heat pump and hot water heater. Don’t miss out on the opportunity to own this fine condo within walking distance to everything that King Farm has to offer: KF Village Center shopping, KF pools and recreation center, central parks & neighborhood metro shuttle bus just outside the building! Fabulous light-filled 2BR/2FB condo in a PET-FRIENDLY elevator building in the heart of Downtown Rockville with southern exposure. This unit features all NEW custom painting, gleaming NEW wide-plank hickory hardwood flooring in all entertaining areas and NEW carpeting in the bedrooms. Living room/dining room combination with sliding glass door to glorious all-season sunroom/balcony with NEW carpet and NEW two-inch blinds; kitchen with NEW granite countertops, under mount sink, high-arcing faucet, and stainless steel appliances; master bedroom suite with walk-in closet, full-sized stackable washer & dryer in closet, and private ceramic tiled bathroom; second bedroom with ceramic tiled full bathroom right outside the door; GARAGE SPACE (#42) and CONCRETE BLOCK STORAGE UNIT (#35) in secure underground garage. Condo fee includes: gas hot water & water consumption, HVAC maintenance, repair, or replacement, common area maintenance, staffed on-site management, and use of fitness room & outdoor courtyards. Be part of the newly designed, vibrant Rockville Town Center featuring shopping, fine restaurants, sidewalk cafes, the new Rockville Regional Library, Regal Cinemas and other entertainment and cultural facilities.